Outlook Express password recovery software allow you to recover all saved E-mail and News group account passwords lost or forgotten (when created on popular E-mail accounts including Microsoft Outlook Express or Office Outlook). The password recovery utility is fully capable to retrieve entire lost passwords (regardless of its length and complexity) for all users on windows operating system supporting all latest versions of Outlook Express and Office Outlook. 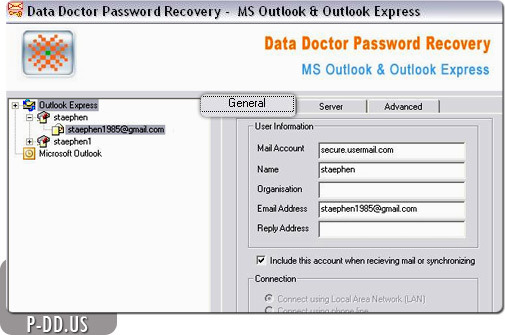 The MS outlook recovery wizard offers quick and simple way to salvage your Outlook Express mail passwords, along with server name instantly within seconds. This GUI utility is very handy to use which recovers all user records including server information (Incoming Mail Server/ Outgoing Mail Server account name and password) and server port number for advance users. Provide an alternate to password recovery services which proves to be costly and time consuming. Recover and Retrieve all Microsoft Outlook Express and Office Outlook E-mail/group account saved Passwords. Retrieve Outlook express multiple user account and identity passwords. News account login, passwords are recovered instantly. Recovers password instantly (with in seconds time)! Support all versions (4.0, 5.0, 5.5, and 6.0) of Outlook express and Office outlook (2003, 2007).